Thanksgiving Comes to 80219 » For 80219, it was a Thanksgiving unlike any other. Imagine people from every walk of life and faith tradition sitting together and sharing a meal. 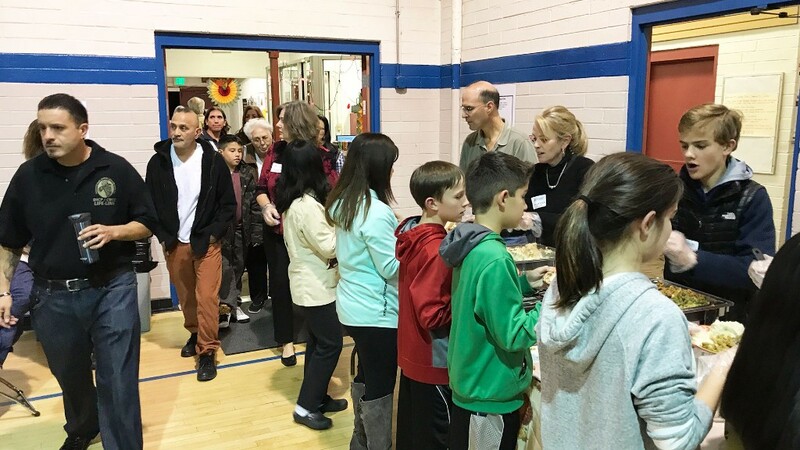 Members of LifeSource Adventist Fellowship together with Porter Hospital and Denver Inner City Parish served a Thanksgiving meal to more than 500 vulnerable community members at the College View Community Center in southwest Denver on November 20. Volunteers filled heaping plates of steaming food for hundreds of people. Also invited were local law enforcement who joined the tables. "It was great to see so many people from so many walks of life and faith traditions sitting together and sharing the meal. We all were grateful for what God has done in our lives," said Dany Hernandez, pastor of LifeSource Fellowship. Planning for this community event began several months back when Jim Feldbush, director of mission and ministry at Porter Adventist Hospital, along with LifeSource pastor Dany Hernandez, met with the leadership of College View Community Center and Denver Inner City Parish. College View Community Center reaches out to the 80219 zip code area of Denver, an area known for its high suicide, crime and drug activity rates. It provides a safe and positive place for vulnerable community members of all ages, serving the community through recreational activities and community events, along with several other programs. Pastor Hernandez hopes to involve more LifeSource members with the programs at College View Community Center. "Such is our mission. We must recognize ourselves as part of a community and help those who are in need." youth needing educational, employment and emotional support, guidance and skill building. According to Pastor Hernandez, as people left at the end of the meal, they were given large bags to fill with groceries provided by LifeSource Fellowship and Porter Hospital. This Veteran’s Day, seventh and eighth-grade students at HMS Richards Elementary took the lead in honoring our nation’s veterans. As part of a class project, the students spent weeks interviewing veterans and creating photo storybooks to highlight and remember their service. During Campion’s church service on November 11, students shared a few details of their stories and invited church members to stay for a reception to show appreciation to veterans. In the reception, students sat side-by-side with military veterans of several eras, and used their books to help facilitate conversations with the church members about the veterans’ lives of service. For many of the veterans, the photo storybooks were a special surprise and they were delighted to have their stories written down in a way that they could share with family members. Herb Nelson, a Vietnam veteran, enjoyed being a part of the project. “It brought the kids and us veterans face-to-face. The kids got to ask questions and it was a lot of fun to share with them. The book was fantastic; everyone that came for Thanksgiving dinner really enjoyed looking at it,” Nelson commented. Many students wrote about their own family members who served and found the process to be meaningful to themselves as a way to learn more about their relatives and preserve their family history. 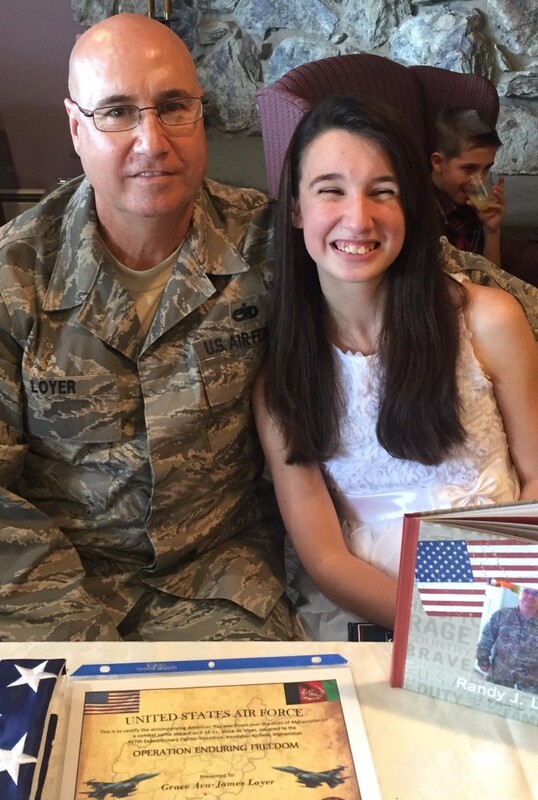 Eighth grader Christine Eagan-Foster wrote the story of her great-grandfather who was a World War II veteran and has since passed away. “The project was exciting for me because I got to learn more about my family and history. Since I never met my great-grandpa, it was interesting to learn about him and write down his story. My whole family is happy to have the book to remember him by,” she said. 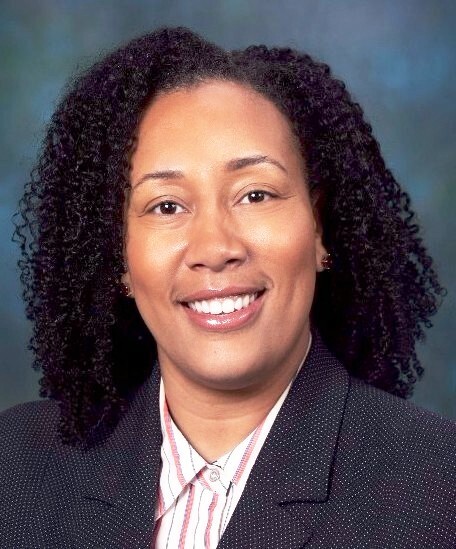 New CEO Joins Avista Adventist Hospital in Louisville » After a nationwide search, Louisville’s Avista Adventist Hospital, a nonprofit community hospital, has hired Jillyan McKinney as its new chief executive officer. She joined the team at Avista Adventist Hospital – Centura Health, on Monday, November 20. “McKinney has an infectious amount of energy. In her role as vice president of strategic business development at Florida Hospital, she initiated several major expansion projects and is credited with facilitating jumps in both volume and hospital profitability,” said Edward Sim, president of Centura Health’s Mountains and North Denver Operating Group. Before her strategic business development role, McKinney served as the vice president of operations. During her tenure, McKinney led a facility expansion, improvements in capacity management and multiple recruitments and physician practice acquisitions. She is referred to as a rising star within the Adventist Health System, with a reputation for bringing greater physician alignment and leading her teams to a collective goal of improving the health and well-being of their community. McKinney earned her BS in Business Administration from Oakwood University in Huntsville, Alabama, and holds a MBA from the University of Central Florida in Orlando, Florida. She also completed a management residency with Adventist Health System in Winter Park, Florida. Loveland Cougars in Action » The Loveland Cougars Pathfinder Club has almost completed its first half of the Pathfinder calendar and has been extremely busy learning, growing and giving back to our church and community. In October, the Pathfinder Ministry took over the entire church service from the beginning to end. One church member commented, "If you missed Pathfinder Sabbath this year, you missed a huge blessing." Another said, "I was extremely blessed by the talent and preparation the Pathfinders presented the service with. Best ever!" The Pathfinders look forward to next year's service and bringing their talents and service to the church. In late October, the Pathfinders went to local church members homes for our first ever Rake and Run event. The Pathfinders raked 10 yards and a total of 141 bags of leaves! It was an all-day event that brought our ministry to a few community members who have never heard of Pathfinders or Campion Seventh-day Adventist church. It was a great opportunity for our club to bless those around us and be a positive public representation of Christ. In November, our Pathfinders started an honor that is completely unique to the North American Division of Pathfinders; the Braille honor. This honor was instructed by Kathy Fay a retired teacher of the blind The Pathfinders were introduced to braille writing machines and other tools used as well as learning to read braille for the sighted. In order to complete this honor, the Pathfinders must work on their own outside of our weekly meetings to become proficient enough to meet the requirements. Those who complete the honor will be among some of the first to receive this honor within the North American Division. This is an honor and a challenge! 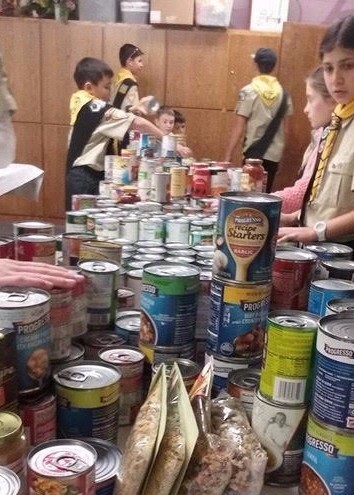 On November 12, the Pathfinders collected 500 cans for the church's Thanksgiving community baskets and in December, look forward to spreading the message of the first advent through Christmas caroling in the community. The first half of the Pathfinder year has gone by quickly and the experience for both staff and kids has been great! We would like to take a moment to thank Natalie Barton for instructing our archery honor in such a fun and creative manner, Stephen Turk for the fantastic experience with the stars, The Rocky Mountain Raptor program for the live raptor presentation, Bill Arrington and the Longmont Thunder for Drill and March and Kathy Fay for her expertise on the Braille honor. As you can see, we have been blessed with lots of wonderful volunteers and are looking forward to the second half of the year. Thank you for your prayers and support as we move into the second half of the year and the Pathfinder Bible Experience season also. Houses of Prayer Everywhere in RMC » Sabbath afternoon, November 11, found more than 40 people from 16 different churches gathered at the conference office for a H.O.P.E. (Houses of Prayer Everywhere) Rally! Pastors and prayer coordinators from around the front range shared practical ideas and suggestions for increasing prayer in our personal lives and in our churches, and led us as we prayed together for our families, pastors, and churches. We shared stories, resources, and laughter, and ended the afternoon with a light supper. If YOU would like to host a similar gathering in your area, please contact DeeAnn Bragaw, our conference prayer coordinator at [email protected]. Prayer Ministry » We are in need of pray-ers who will volunteer to pray before and during the Revelation Speaks Peace meetings, coming up in January. If you can help, please contact prayer coordinator DeeAnn Bragaw, [email protected]. We need both folks who are willing to pray out loud, OR pray silently! YOU can pray! All are welcome; all are needed. Reach out today and volunteer! 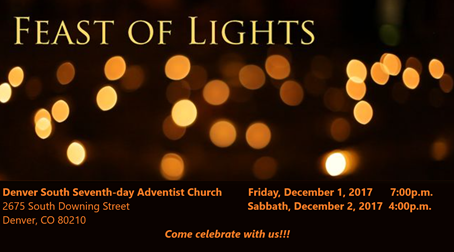 Denver South Church » The traditional Feast of Lights concert is coming to Denver South Church December 1, 2. For more information, contact Douglas Macomber at 303-744-1271. Franktown Church Christmas Program » Celebrate the season! You are invited to an evening of Christmas celebration as the Franktown Church youth and adult choirs present, "The Gift" on December 9. The program will begin at 6:30 p.m. with carols by the Christmas brass ensemble led by Jerry Lange. The Franktown Church is located at 905 N. Highway 83, Franktown CO 80116. Lighthouse Christian School » To Adventist schools around the world, we want YOU in our school's International Christmas program! Watch this video, and read the comments for details. We want your school to make a short video for us and our students want to interview you for a report in our program. Help us create a truly international "Christmas Around the World" program. Together, we are one family, and we want to celebrate that. Or, you can donate online at www.campionchurch.org and mark it Prayer Garden. This project will take a few years to be fully developed, but plans include terraced flowers, benches, stone paths, gazebo, fountain, and a prayer box. Phase One includes a bench and a prayer box. We want this to be a special blessing for the church, campus, and community for many years to come! Cookbook Benefitting Lighthouse School » Eric Aakko, husband of Lighthouse teacher Jodie Aakko, authored a 200-page, full-color cookbook printed by Pacific Press. Profits from the sale of this first edition go to Lighthouse. Eric Aakko, MCHES, is a certified, plant-based, chef educator. The book is available for $24.95 at the Denver ABC, Eric's website www.speakingwellness.com or Old Firehouse Books in Fort Collins. It features gluten-free, oil-free, plant-based recipes. Mile High Academy » MHA has an immediate opening for a PT Accountant (20 hours/week, Monday - Friday). The position reports to the Director of Finance, completing job duties such as check disbursements, reconciliations and billings. For more information regarding job duties, expectations and how to apply, visit the job posting at http://www.rmcsda.org/hr-accountant. 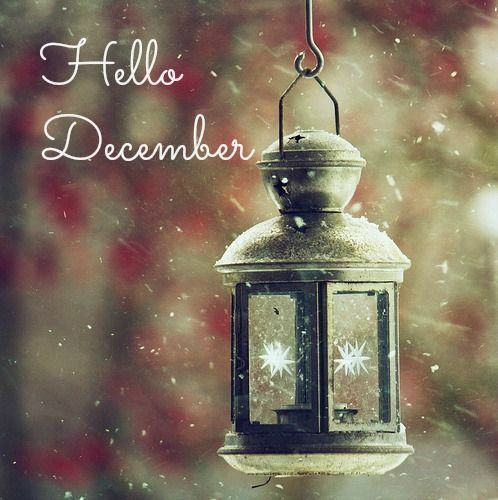 December 1, 8:00 a.m. - 12:00 p.m.
December 5, 8:00 a.m. - 12:30 p.m.
December 13, 9:30 a.m. - 12:30 p.m.
December 19, 9:30 a.m. - 12:30 p.m.